Egyptian Americans for Freedom and Justice (EAFJ) President Hani Elkadi and spokesman Mahmoud El Sharkawy asked that aid to Egypt's military rulers be cut off due to the regime's human rights record, according to a video of one of the meetings that Elkadi posted on his Facebook page. A staffer for an unidentified member of Congress expressed sympathy with the EAFJ members and told them that his member thought President Trump should not have hosted Egyptian President Abdel Fattah al-Sisi at the White House. The EAFJ officials' support for violently overthrowing al-Sisi was never mentioned in the video. Elkady and El Sharkawy's support for the Egyptian terrorists is made clear by their social media posts. In February 2015, they posted PRM's bloody hand logo with a communiqué from the terrorist group to their respective Facebook pages. The communiqué claimed responsibility for attacks on two police cars, but it did not provide additional details. It included the motto: "God, Martyrs, Revolution" in Arabic. 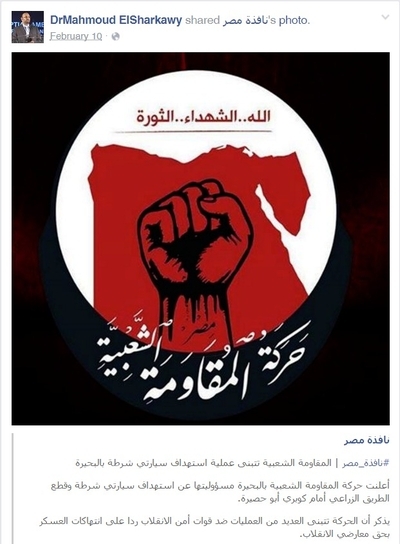 The same bloody hand logo appears on a PRM-linked Facebook page called @Popular.Resistance.EGY that the PRM uses to claim responsibility for its attacks. The PRM reportedly was founded by three Muslim Brotherhood officials who wanted to react violently to the Brotherhood's ouster from power by the Egyptian military in 2013. Its first communiqué came on the first anniversary of the military's deadly assault on Muslim Brotherhood demonstrators in Rabaa Al-Adaweya and Al-Nahda squares. "We shall pay willingly with our blood until we crush the lackeys of Israel," the communiqué said. "Retribution for the martyrs is our right, and we shall eventually attain it. So long as people seek their rights, their rights will not be lost. Allah .... Martyrdom ..... Revolution." "The Revolutionary Punishment Movement executes one of the traitor guides in Helwan!!" El Sharkawy wrote on Facebook. Among the examples, is former Muslim Brotherhood parliament member Muhammad Sagheer's 2015 statement: "To the decisive Revolutionary [Punishment] movements: [Coptic businessman Naguib] Sawiris declared that it was he who was financially supporting the Tamarrud movement [which worked to topple the Mursi regime]. I hereby tell you that his property and institutions are a legitimate revolutionary target. Rebellion [Tamarrud] will encounter retribution." Abu Emara, a former top Muslim Brotherhood leader, told Egypt's Al-Bawaba newspaper that the RPM's fighters belonged to the Brotherhood. Poole told the Investigative Project on Terrorism that a similar incident happened in January 2016 after Egypt's Interior Ministry raided a bomb factory on a farm outside Cairo. Evidence recovered in the raid led police to an apartment in the city of Giza where their suspects blew themselves up killing the officers. "They were pursuing Muslim Brotherhood people and lo and behold Revolutionary Punishment put out a claim of responsibility on social media, and later so did the Islamic State," Poole said. "In every one of those cases, whether it's Popular Resistance, Revolutionary Punishment, both the Interior Ministry and NGO experts like [former Sinai security chief] Khaled Okasha, those groups are all part or were part of Mohamed Kamal's network. Kamal was the youngest member of the Muslim Brotherhood's Guidance Bureau – its top organ – who was killed in a shootout with Egyptian police last October; authorities identified him as the head of the Muslim Brotherhood's "armed wing." He established a network of terror cells in Cairo and in Upper Egypt, mostly made up of Muslim Brotherhood youth members, Poole said. 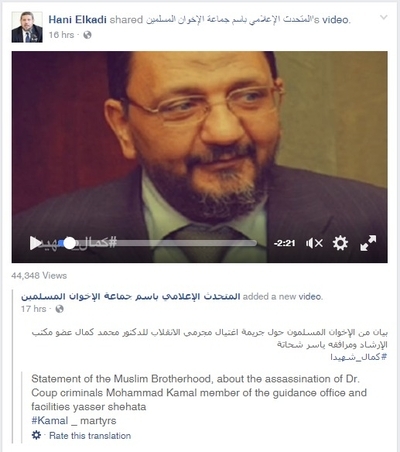 Another post includes an official Muslim Brotherhood communiqué condemning Kamal's "assassination" by the "coup criminals" with the hashtag #Kamal_martyrs. He attended meetings of the Egyptian Revolutionary Council (ERC) – a group of exiled Morsi-era Muslim Brotherhood politicians – over the May 5 weekend in Istanbul. The website of the banned Freedom and Justice Party (FJP) notes that Elkadi reported on EAFJ's activities in America including its recent meetings on Capitol Hill. 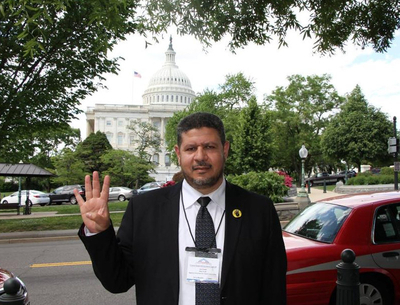 Other EAFJ member who participated in "Egypt Day at Capitol Hill" publicly endorsed violence or intimidation. Aber Mostafa, for example, posted the personal information of a pro-Sisi owner of an Egyptian soccer team with the word "Attaaack!" on the same day that Elkadi and El Sharkawy reposted the PRM communiqué. Ayat Al-Orabi, a member of the Egyptian Revolutionary Council who participated in the lobbying trip, has spouted venom against Egypt's Christians. In September, she accused Christians of "waging war on Islam," a leading narrative terrorists use to gain recruits. "Egypt is Islamic even if occupied by the coup gang and even if assailed by the apostate criminal lackey of the Zionist entity," Orabi said. "They must realize that the crescent is above the cross, and Islam is above all." It's clear that the EAFJ delegation visited Capitol Hill. It is not known, however, how many offices agreed to meet with them. Given the open support for jihad and terrorist groups by key delegation members, it's a wonder they got anywhere near the halls of Congress.